VCI’s generally come as solid, for convenience in handling. Volatility is simply a means of transport. Protective vapors disseminate within an enclosed space until equilibrium–determined by the partial vapor pressure–is reached. The inhibiting process starts when the vapors contact the metal surface and condense to form a thin barrier of micro-crystals. In the presence of even minute traces of moisture, the crystals dissolve and develop strong ionic activity. The result of such activity is adsorption of protective ions onto metal surfaces, with the concurrent formation of a molecular film that fosters breakdown of contact between the metal and an electrolyte. The presence of an invisible monomolecular film does not alter any of the important properties of the metal, even in precise electronic application, where properties such as conductivity, or dimensional tolerances are critical, and where even minute deviations could cause malfunction. VCIs migrate to distant metallic surfaces. This ability enables VCIs to protect metals without direct contact with metals. VCIs need only to be placed in the vicinity of the metals to provide protection. VCIs will migrate to metallic surfaces through the vapor phase and the inhibitor will be adsorbed on the surface. The protective vapors will distribute within the enclosed space until equilibrium is reached. Equilibrium is set by the compound’s partial vapor pressure. Too high a vapor pressure will cause the inhibitor to be released to such an extent that a protective concentration cannot be maintained. On the other hand, a low-vapor-pressure inhibitor is not used up as quickly and can thus assure more-durable protection, but more time is needed for a protective vapor concentration. This raises the risk of corrosion during the initial period of saturation, and if the space is not sealed, a protective concentration may never be reached. Proper selection of volatile compounds enables controlled and dependable volatilization. The higher the temperature, the stronger the tendency of the metal toward corrosion. The volatilization rate of VCIs has a similar function dependence upon temperature, so that more inhibitive material is evaporated at higher temperatures. VCIs can thus self-adjust to the aggressiveness of the environment, over a wide temperature range. What are YOU doing to control YOUR corrosion problems? increasing productivity, customer satisfaction and profitability. 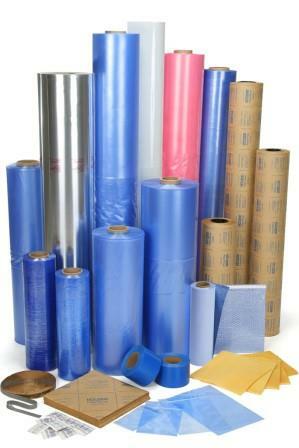 during the manufacturing, packaging and/or operational stages of a product. coating to protect metal parts. However, there were early problems . . . The VCI active side should face the metal. The metal part should be no more than 300mm from the VCI product. The closer to the metal, the better is the corrosion protection. (10-25 sq. ft) of metal surface. Use at least 1m2. of VCI for every 0.25 cubic meter of void space. Use VCI to separate metal from acidic packing materials such as corrugated boxes and wooden pallets in order to prevent corrosion at the contact points. VCI2000 recommends inventorying no more than a six month supply of VCI packaging Store unused VCI in a cool, dry place, away from direct sunlight. For best results, we recommend testing the VCI product for compatibility prior to use.